Mystery at the Biltmore Estate | Kid Reporters' Notebook | Scholastic Inc.
How would you explain what your book is about to people who have never read it? 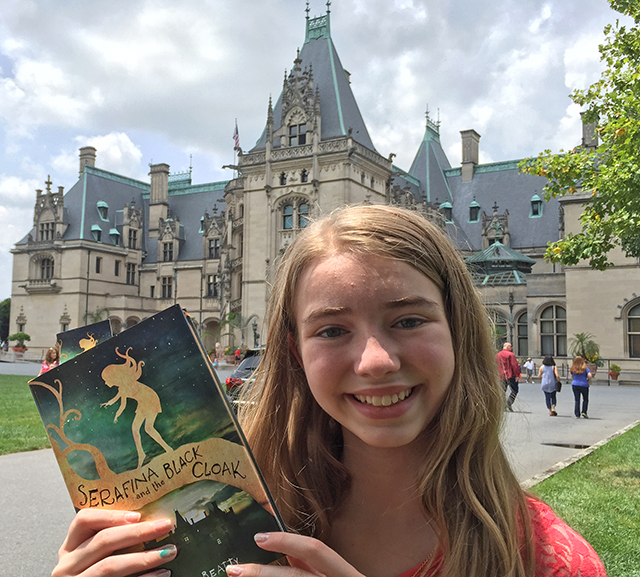 Serafina and the Black Cloak is about a strange and intriguing girl who lives secretly in the basement of a grand mansion called Biltmore Estate, in 1899. Her father has warned to never let herself be seen by the rich folk who live upstairs, so she prowls the darkened corridors at night, sneaking and hiding, using the mansion’s hidden doors and secret passages. One night, she sees a sinister man in a black cloak and then the children of the estate start disappearing. Only Serafina and her friend Braeden know the clues to follow to solve the mystery. Why did you want to write a book? What was your inspiration? I’ve written stories all my life. For this particular story, my inspiration was my daughter who loved to sneak up on me when I was trying to write. My other inspiration was the Biltmore Estate, which is a real-life place. I understand you have three daughters. Did they have any role in encouraging you to write this story? When my eldest daughter was about 11, she encouraged me to write a story that she could read (previously I had been writing books for adults). When I gave it a try, I found that I totally loved writing for her and her sisters and their friends. Once I started Serafina and the Black Cloak my daughters and wife helped me every step of the way. They helped develop the character, create the plot, and fine-tune the writing. This has been a family project from the beginning. It took about a year to write, revise, and finish. Why did you set your book at the Biltmore Estate? I love the Biltmore Estate. It’s vast and opulent, and my imagination runs wild whenever my family and I go there. What is the target age for Serafina? What lessons do you want young readers to learn from your story? There are many lessons in the story. One of the main lessons is that every person is individual and different and has a unique set of strengths and talents, as well as weaknesses. It’s almost as if we are all pieces of a jigsaw puzzle, and we are made to fit together into a cohesive community. One of the other lessons is a quote from the book: “Our character isn’t defined by the battles we win or lose, but by the battles we dare to fight.” Some of the other lessons include: the importance of friendship, loyalty, bravery, and persistence. Was Serafina inspired by a real-life person. If so, who? She was inspired by my daughters. Do you plan to make Serafina into a book series? If so, could you give us some idea of what the next book will be about? Yes, I am hoping to have the opportunity to publish more of Serafina and Braeden’s story at the Biltmore Estate. There is much more to their story to tell. What advice would you give to kids who want to write their own stories? The main thing is to start writing and keep writing. It takes practice. Just keep writing, listening to your readers, and then writing some more. Could your book be turned into a movie, and what would you think if that happened? I love movies as much as books, so I would totally love for my book to be turned into a movie. I enjoy making robots with my daughters: www.beatty-robotics.com. When I have time, I also enjoy bird watching, horseback riding, going to the movies, reading books, and traveling to other countries.